Coldfair Green is the largest village in the parish of Knodishall, which has its medieval parish church about a mile to the west. 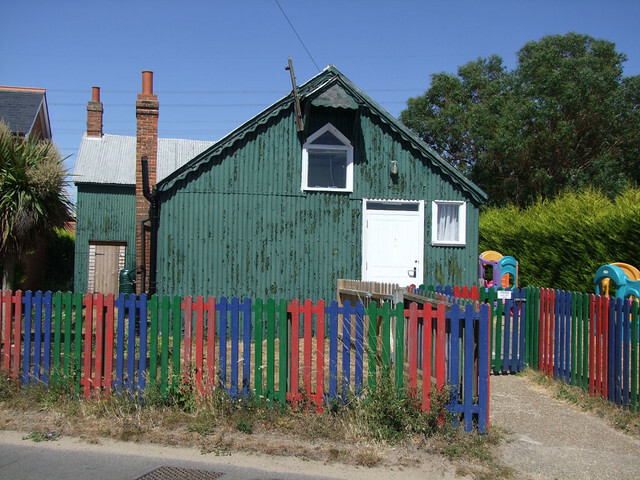 The local playgroup meets in a green tin tabernacle building, which was originally erected as St Luke's mission church by the parish of Leiston. The local record office holds details of their baptisms from 1911, which seems a likely date for the construction of this building. Tin tabernacles, which are of course made of corrugated iron not tin, were bought as construction kits and erected by local labour, usually the congregation of the church. I couldn't see a manufacturer's plate from the road, but it may well have been the work of the Leiston foundry, or possibly Boulton & Paul in Norwich who were one of the major producers of tin tabernacle kits. There were once thousands of them all over Britain, and a few hundred still survive. Of course, most, like St Luke, are no longer in use as churches.